“Tis the season, for Hall of Fame voting. That means, of course, that today must be Cyber-Monday, the day in which I spend around six hours in my sweat-pants — pot of coffee at-the-ready — poring over statistics, analyzing the career records of various retired players…oh, wait, I do this all the time anyway. 2) The player not only has to be retired; he also has to have appeared on the BBWAA HOF ballot at least once since he’s been retired. 3) The player has to meet basic Hall of Fame requirements, such as having played at least ten seasons in the Majors, can’t have been deemed ineligible due to “legal” issues (do you hear me, Pete Rose? ), etc. And that’s basically it. So let’s get started. 1B Jeff Bagwell: (1991-2005) A no-brainer. Baseball-Reference.com (I’ll constantly be referring to this invaluable website throughout) has Bagwell listed as the sixth greatest first baseman of all-time. Thirty-eight players have reached the 30 (homers) – 30 (steals) club in baseball history. You know how many of them have been first basemen? Just one. Jeff Bagwell. And he did it twice. Bagwell’s career OPS+ of 149 is tied for 36th best in baseball history, at any position. He was an outstanding base-runner, a very good fielder, could hit for both power and average, and was durable, leading the league in games played four times. His 1,788 runs created is tied with HOF’er Al Simmons for 39th all-time, ahead of such immortals as Mike Schmidt, Cal Ripkin, Jr., Reggie Jackson and Eddie Mathews. Bagwell was the N.L. Rookie of the Year in 1991, and the league’s MVP in 1994. Last year, Bagwell was named on 56% of the ballots cast by members of the BBWAA. Apparently, the other 44% were a bit scared off by “rumors” that Bagwell might somehow have been associated with the steroids scandal. Yet the fact remains that no evidence has surfaced that Bagwell had anything to do with steroids at all. Hopefully, another 20% of the BBWAA will come to their senses this year and vote Bagwell into The Hall where he clearly belongs. 2B Bobby Grich: (1970-86) Baseball-Reference (from here on out, B-R), ranks Grich as the 8th best second baseman of all-time. The seven listed immediately ahead of him, and three of the four directly behind him, are all in the Hall of Fame. Grich’s 67.3 WAR is higher than the average of the 19 second basemen in The Hall. A four-time Gold Glove winner, Grich was an excellent defensive second baseman. He also had good power for a middle infielder, slugging 224 career homers, including a league-leading total of 22 in the strike year of 1981 (100 games played), and 30 homers in 1979. SS Alan Trammell: (1977-96) Bill James ranked Trammell as the 9th best shortstop of all time. B-R has him ranked in 11th place. So let’s compromise and call him the 10th best shortstop ever. Now, if you are among the top ten players in one of baseball’s most difficult defensive positions, it seems logical that you belong in The Hall, doesn’t it? Alan Trammell’s career WAR of 67.1 is exactly the same as recent HOF inductee Barry Larkin. It is also better than 13 other shortstops already in the HOF. Trammell and his keystone mate Lou Whitaker were each always among the best defensive players at their respective positions in their era. Trammell was the best player in the A.L. in 1987, batting .343, with 205 hits, 109 runs scored, 28 homers, 21 steals and 105 RBI (and his usual stellar defense), but finished second to George Bell in MVP voting due to Bell’s gaudier power numbers. Trammell won several Gold Gloves, posted a solid .285 career batting average, slugged 185 homers and 412 doubles (shortstops were not yet necessarily expected to be dangerous hitters, as would become the norm a bit later), and played his entire 20-year career (1977-96) in Detroit. This year will be Trammell’s 12th on the HOF ballot. Last year, he was named on 36.8% of the ballots. Perhaps the BBWAA will take a more serious look at Trammell’s career this time around and give him the boost he needs to make it into The Hall before his eligibility runs out in just a few more years. He certainly belongs there. 3B Ken Boyer: (1955-69) As perhaps many of you already know, third base is the least represented position in the HOF. Only eleven third basemen are in The Hall, and it took Ron Santo’s drawn-out induction last year to get the number that high. Ken Boyer should be inducted to make it a dozen. Boyer is rated by B-R as the 14th best third baseman of all time. Of the 13 players listed ahead of Boyer, three are either currently active or have recently retired, one — Edgar Martinez — wasn’t really a third baseman at all, and all but one of the rest of them are already in The Hall. Only Graig Nettles is as qualified as Boyer to stake a claim on this list. Ultimately, I chose Boyer because I believe his overall game was a hair better than Nettles’ was, and because Boyer was selected to play in eleven All Star games in 15 years, while Nettles was chosen six times in 22 seasons. For a solid decade, 1955-64, Boyer was always one of the best players in the N.L. 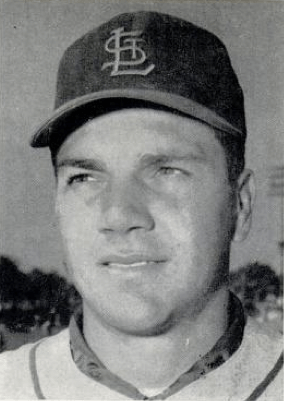 In 1964, the year in which the Cardinals defeated the Yankees in the World Series, Boyer led the league with 119 RBI and was named N.L. MVP that season. A five-time Gold Glove winner, Boyer ranks 20th all-time in assists as a third baseman. Boyer also hit for solid power (282 homers), had very decent speed (68 triples), and finished his career with a respectable .287 batting average. Boyer was dropped off of the BBWAA’s HOF list after receiving just 11.8% of the vote in his final year of eligibility in 1994. Yet, as of this writing, Boyer remains the best third baseman not in the Hall of Fame. Perhaps some day, a future Veteran’s Committee will endorse his induction into the HOF. C Ted Simmons: (1968-88) Simmons HOF candidacy was always hurt by the fact that his career largely occurred during what can now be considered a Golden Age of catchers. In the 1970’s and into the ’80’s, there was no shortage of World Class catchers: Johnny Bench, Carlton Fisk, Thurman Munson, Gene Tenace, Bob Boone, Darrell Porter, Jim Sundberg and Gary Carter, among others, each donned the so-called tools of ignorance. Ted Simmons had a fine career, but was overshadowed by some of these other catchers. Still, B-R ranks Ted Simmons as the 10th best catcher of all-time. Simmons was an underrated defensive catcher, though no match for several of the others I’ve listed above. But more to the point, Simmons was a catcher who could really hit. Here are his batting averages from 1971-80: .304, .303, .310, .272, .332, .291, .318, .287, .283, and .303. After switching leagues at age 31, leaving the Cardinals for the Brewers, Simmons caught fewer and fewer games every year, becoming increasingly a 1B / DH. Despite the competition at his position and in his league, Simmons was named to eight All Star teams in his career. Only one catcher, Pudge Rodriguez, has ever hit more career doubles than Simmons’ total of 483, and his 1,389 RBI is also the second highest total of all time by a player whose primary position was catcher, surpassed only by Yogi Berra. Strangely, Ted Simmons was only on the BBWAA HOF ballot for just one year, 1994, in which he received just 3.7% of the vote. Looking back nearly 20 years later, it’s difficult to understand how Simmons could garner such little support for such an excellent career. LF Tim Raines: (1979-2002) In my opinion, after Jeff Bagwell, Tim Raines is the best player not in the Hall of Fame. And other than Rickey Henderson, I believe that Tim Raines was the best top of the order, base-stealing, run-producing player of the past eighty years. Tim “Rock” Raines stole 808 bases in his career, leading the league in steals four times. He stole at least 70 bases in a season in each of his first six years in the Majors. Significantly, he never led the league in times caught stealing. By way of comparison, Lou Brock led the league in steals eight times, but also led in times caught stealing seven times. Raines career stolen base success rate of nearly 85% is one of the best in MLB history. But Raines was also an excellent all-around run producer. He created exactly 1,636 runs in his career, the same total as Tony Gwynn, and more than Joe DiMaggio, Roberto Clemente, Willie Stargell, and former teammate Andre Dawson. Of the seven left-fielders ranked ahead of Raines by B-R, five are in The Hall. The other two are Barry Bonds and Pete Rose (see the link to an article about Pete Rose below.) There are 13 left-fielders who rank behind Raines who are in The Hall. Clearly, Raines has more than a legitimate case to be enshrined in The Hall. Until that day arrives, however, he will remain the best left-fielder not in the HOF. CF Jimmy Wynn: (1963-77) Frankly, although I’ve always been a fan of Jimmy Wynn, I didn’t expect him to be my center-fielder on this list. But I am happy to say that he fits the bill. B-R ranks Wynn as the 15th best center-fielder ever. Each of the 14 listed ahead of him are either already in The Hall, are currently active, or have only recently retired. Kenny Lofton (ranked 8th) appears on the HOF ballot for the first time this fall. I’ve made this argument before, but let me briefly state it one more time. If you took HOF’er Jim Rice and placed him in the Houston Astrodome for the majority of his home games, and you put Jimmy Wynn in Fenway Park for the majority of his, then Wynn would be in The Hall, and Rice would be remembered as a very solid player along the lines of say, Joe Carter. In 1967, for example, the entire Astros team hit just 93 home runs. Jimmy Wynn hit 37 of those homers, representing an astounding 40% of all of the Astros homers that season. The aging Eddie Mathews and a very young Rusty Staub each hit 10 homers that year, good for second place on that team. Meanwhile, flashing ahead ten years, Jim Rice led the A.L. with 39 home runs. But among his teammates, George Scott hit 33, Butch Hobson hit 30, Yaz hit 28, Fisk hit 26, and Fred Lynn hit 18. The BoSox as a team that year hit 213 home runs in ’77. Therefore, Rice’s 39 represented just 18% of the team total. Obviously, then, time and place matter a great deal when attempting to judge a given player’s value. Aside from Jimmy “Toy Cannon” Wynn’s enormous power, Wynn was an on-base machine, reaching at least 90 walks in a season nine times, including a league-leading 148 walks in 149 games in 1969. Wynn’s career lasted from 1963-77, spent almost entirely in the N.L. His career OPS+ of 129 is, perhaps a bit ironically, one point better than Rice’s career mark of 128. If Kenny Lofton fails to be voted into The Hall this year, his first year on the ballot, then he will become the best center-fielder not in The Hall. But unless that happens, Jimmy Wynn will remain the best one not in the HOF. RF Larry Walker: (1989-2005) I know what you’re going to say. Two Words: Coors Effect. I’ve already written one entire blog-post about why Larry Walker belongs in the HOF. But briefly, both before and after he played his home games at Coors Field, he was always an outstanding baseball player. B-R ranks Walker as the 9th best right-fielder ever. His career WAR of 69.7 almost perfectly matches the 69.5 average of the 24 players in The Hall at his position. As a fielder, Larry Walker was credited with 150 outfield assists, good for 12th place among all outfielders in baseball history. He won seven Gold Gloves for his fielding. He won those Gold Gloves as both a member of the Expos and the Rockies. Walker was an excellent base-runner. Among those who saw him play, it was rare that anyone ever saw Walker make a base-running mistake. He slugged 471 doubles and 62 triples in his career, always ready to take the extra base on an unsuspecting outfielder. He also stole 230 bases in his career, posting a respectable 75% success rate in that category. Walker could hit for both average and power. His career line of .313 / .400 / .565 places him among the greatest right-fielders in history, as does his career OPS+ of 141 (which takes into consideration a player’s time and place.) Although Walker clearly hit better at Coors Field (and why, precisely, should that be held against him?) he also hit very well pretty much everywhere else. In the final 144 games of Walker’s career, which he spent with the Cardinals after leaving Colorado, the 38-year-old Walker posted a batting line of .286 / .387 / .520 with an OPS+ of 134, fine numbers for a player on the verge of retirement. In some cases, a player is almost completely a product of his environment. Dante Bichette comes to mind. In other cases, though, an already great player uses his environment to his advantage. Larry Walker belongs in the latter category. One other place Larry Walker belongs is in the HOF. Until that happens (and Walker will be on the ballot for the third time this year), Walker will remain the best right-fielder not in the HOF. DH Edgar Martinez: (1987-2004) I’m not a big fan of the Designated Hitter rule, but I am a fan of Edgar Martinez. Quite simply, Edgar Martinez is one of the greatest right-handed hitters in baseball history. Edgar appeared in just 564 games as a third baseman out of 2,055 games played, so he can be said to have been a player without a legitimate defensive position. There was a time I would have held this against him, as, apparently, many BBWAA voters still do. The fact remains, however, that Edgar Martinez was simply the best pure D.H. in baseball history. Martinez hit .312 for his career, winning two batting titles along the way. He hit 514 doubles, 309 home runs and drove in over a hundred runs six times. His career OPS+ of 147 is the same as HOF’ers Mike Schmidt, Sam Thompson, Willie McCovey, Willie Stargell and future HOF’er Jim Thome. Martinez played his entire 18-year MLB career with the Seattle Mariners. Given the evolving way in which the D.H. position is being used these days — some teams have begun rotating their regular players through the D.H. to give them more rest — it is possible that Edgar Martinez will go down in history as the best Designated Hitter of all-time, regardless of whether or not he eventually makes it into the Hall of Fame. So those are my choices for the nine best players not in the Hall of Fame. Do you agree or disagree with my choices? I’ll be interested to find out. Next time, I’ll examine the best pitchers who are not in the Hall of Fame. Excellent as always Bill, well written and exhaustively researched. I was glad to see Bagwell improve to 56% last year. I thought the 41% he received in his first year of eligibility was the height of HOF voters overreacting to the steroids era by damning everyone from that time. Guilt by association run amuck. Hopefully he will continue to improve his vote total, and if not this year then perhaps next will make it over the top. Meanwhile today brought the sad news of Marvin Miller’s passing. If ever an individual who never wore a uniform belongs in the HOF, it’s him. The fact that he isn’t is a continuing disgrace; but ultimately it is a sad commentary on the HOF and the voters, not on Miller. Mike, Thank you so much for the kind words. I saw the news about Miller, and share your thoughts on him being left out of the HOF. It’s a continuing disgrace. As for Bagwell, I’d like to see both him and his former teammate Craig Biggio get elected into The Hall together this year. That would be cool. There’s no question that the BBWAA has been overreacting to the entire PED issue. I’ll bet Piazza draws less support than he should for the same reason, unfounded rumors. It is a sad lack of justice that Miller will never be inducted while Bud Selig (who is either some Wodehouse-esque bumbling uncle who good things somehow happen to, or perhaps the bizarro-world anti-Yuri Zhivago) will get to enjoy his plaque in Cooperstown. Well, W.K., I couldn’t have put it better myself, my friend. That about sums it up. Hi Adam, I have to agree with you on all counts. I also have to admit, I hadn’t even considered Dr. Jove as a HOF-caliber contributor to the sport of baseball, but it makes sense. Thanks for sending along the link. The link is new to me, but I remember writing an article about Jobe for the Hall several years ago. It just makes sense. Another great one, Bill. First of all, can you believe I’d never heard the idiom “Let the dead bury the dead,” and I’m pretty familiar with the Bible. I know it now, thanks. The cool thing about this All-Star wannabe team is that I’ve heard of every one of them. I know what you’re going to say. Two Words: Coors Effect. Edgar Martinez is one of my favorite players. I was at the game where he played his last game at third (I’m pretty sure the game I saw was his last at the position). As I recall he had a collision with Dan Wilson, the Catcher, and was out for a while. Hi Adam, As for the quote, I can’t say that I’m a Biblical scholar, but I did stay in a Holiday Inn Express last night. As for being Canadian and getting into The Hall, I think Fergie Jenkins broke down that barrier years ago. Can you imagine the audacity of those people? They come here, take good-paying jobs from us “real” Americans, then expect to be rewarded with HOF membership, just because they have fine careers. Next thing you know, they’ll be inter-marrying with our people, then that’ll be the end of our American Exceptionalism! Here’s a post you might enjoy regarding Edgar Martinez. It’s a good one. That was an interesting article, and inspires two thoughts. 1) Although (as the article says) Edgar Martinez wasn’t well known in Seattle in the late 1980s and early 1990s, that very much changed after 1995. 2) Thanks also to the article, which mentions Edgar’s collision with the catcher (backup Marzano, apparently, and not Dan Wilson as I claimed), I was able to look through my tickets and confirm that I WAS at that game. It was in Anaheim. It would have been cool to have been able to just walk up to him as he sat there reading the newspaper at the mall, and say, “Hey, Mr. Martinez, just wanted to tell you I think your one helluva player.” Sounds like quite the regular, unassuming type of guy. John Marzano, career WAR, -0.2. Not a good one. I’m basically in complete agreement on your list. I find Whitaker and Grich to be a tossup at 2B. Personally, I’d name Whitaker, but have no problem with Grich. At catcher, I have a tossup between Simmons and Joe Torre. I think I’d go with Simmons, as you did. If Mike Piazza misses induction this year, he’d be the new catcher. The one spot where we differ is 3B. I have a hard time with Boyer standing out over Nettles, Bell, and Bando. What I would do is relax your rule against 19th century players and choose Deacon White. If I could only put five guys in, he’d be on that list. Of course, if you relaxed that rule, we’d have to debate Bill Dahlen vs. Alan Trammell. They’re also a tossup, though. I noticed, of course, that you have “Sweet Lou” Whitaker at the top of your page, thus, now I have a better idea of why you prefer Whitaker to Grich. I went with Grich in part ’cause his OPS+ of 125 is somewhat higher than Whitaker’s still quite decent 117. But yeah, either one works. The reason I chose Boyer over any of those 1970’s guys was that, in my opinion, Boyer was the best all around N.L. third baseman of his generation. Also, he won an MVP award, and I think offered more as a base-runner than any of the other guys. I like Nettles, Bando and Bell a lot, and originally was going to go with either Nettles or Bando, but in a way, they all cancel each other out. Also, as much as I like Nettles, a career .329 on-base percentage just isn’t going to cut it, no matter how much you offer on defense. I also think Boyer was a bit better than Bando with the glove. Bell was a fantastic glove man, and no slouch with the bat, but I like Boyer’s hitting a bit better. Not a lot of difference overall between these guys. Any of them would be reasonable picks, I think. Working on the pitchers at the moment. You’re right. It’s not easy! I might go with Dale Murphy over Wynn, but I’ve always thought Wynn was way underrated and certainly not a bad choice for your list. Nice job. Think Bagwell will make it this time? BTW, can’t seem to find a way to click “like” on your posts. What am I missing? Hi, Dale Murphy was my original choice. I actually had him penciled in, until I went over to B-R and did more research. I think Murph is in his final year on the BBWAA ballot this year. I’d like to see him get in, but don’t think he will. As for your other question, when you’re reading the posts, are you clicking on the title of the post first, or are you just reading what comes into your In box? I think you have to actually click on the heading of the post, then scroll down all the way to the bottom, to make it work. Otherwise, I’m not sure. Anyway, as always, thanks for reading. I’m almost in complete agreement with your list–you can argue Whitaker over Grich, and Glen’s argument for Minoso is a good one as well, although Raines is so eminently qualified that his argument is tough to ignore. Whitaker and Trammell would have made a nice keystone combo for my team, but I have to go with Grich on this one. I’m a fan of Minoso as well. Only downside I can find regarding Minoso is that he led the league in steals three times, but in times caught stealing six times. At some point, he should have just stopped running. But that’s just quibbling. He deserves a plaque, as does Tim Raines. I just assumed Ken Boyer was in the Hall. Ron Santos, who I agree is worthy of the Hall at last, was generally rated lower than the perennial All-Star Ken Boyer when they were playing. Talking of third basemen, how about Matt Williams? You know, I was under the impression that Ken Boyer was in The Hall not that long ago. It still comes as a surprise to me that he’s not. As for Matt Williams, I like the guy a lot. Nice defense, excellent power. B-R currently has him ranked as the 27th best third baseman of all time. I’d rank him higher, perhaps around #20. There are a lot of other very good third basemen out there, like Graig Nettles, Buddy Bell, Robin Ventura, Darrell Evans, Sal Bando, Ron Cey, etc. Most of them seem to have played in the ’70’s or ’80’s. Not a great deal of difference between them, which I guess is why none of them are in The Hall. Of COURSE it’s a popularity contest. And that’s why induction into the Baseball Hall of Fame has become dubious, at best. I know you’re probably tired off me saying it, Bill, but Minnie Minoso should be in the Hall of Fame. Look up his stats. You can’t dispute them. Why he’s left out on many people’s lists is a mystery to me. There are MANY articles around the web that make a strong case for Minoso. And I think that it borders on the absurd that a guy who played a total of 592 games in the field (Edgar Martinez) should be in the Hall of Fame. He belongs in the Baseball Hall of Fame like the Dave Clark Five belong in the Rock N’ Roll Hall of Fame. (Believe it or not, the Dave Clark Five IS in the Rock N’ Roll Hall of Fame.) Both halls of fame have lost credibility in many people’s eyes. I have no problem with Minnie Minoso as a HOF’er. I’d put Tim Raines in first, but I agree that Minoso has a legit argument for induction. As for Edgar Martinez, I guess the question is, which is worse, playing the field poorly for 2,200 games like, for example, Ted Williams, or not playing it at all? I don’t like the DH rule, either, but I see no reason to hold that against Edgar. He didn’t invent the rule, and, if it didn’t exist, I’m sure he would have played third base, however poorly, for his career. As with Williams, his outstanding bat would have kept him in the lineup. Meanwhile, here comes Frank Thomas. The Big Hurt, who played in the field in just 971 of his 2,322 games, is virtually a shoo-in either this year or next for the HOF. You’re just not going to keep out a two time MVP who hit 521 homers and had a .300 career batting average, even though he was mostly a DH. As for The Hall itself, it remains probably the most talked about institution in American sports. Virtually all institutions have lost credibility in people’s eyes over the past 20 or 30 years. It doesn’t mean they’re doing a worse job than ever before; it probably correlates more strongly with the 24-hour, scandal-loving news cycle that has become ubiquitous over the past generation. Conflict and controversy sell. The Hall is no more or less immune from this brave new world than Congress, the Vatican, or the local 4-H club. Fantastic stuff, Bill. Also, this is a great response to the anti-DH in the Hall argument. I’m still amazed at how many people there are who rail against the concept of a DH in the Hall, but have absolutely no problem with all the guys in the Hall who were terrible fielders. Thanks, Dan. I’ll be looking forward to your point of view on the pitchers I’ll be choosing for this team. I hope Alan Trammell gets in, there are so many players that deserve serious consideration, and they are overlooked, sometimes I worry the HOF is a popularity contest. Worse than being simply a popularity contest. Hell, that describes the Academy Awards. The worst part is, it is often a completely arbitrary popularity contest.